For $2,000, To Infiniti And Be-Owned! Charlie Palmer was the poet who famously penned the inspirational verse Try Try Again. Today’s Nice Price or Crack Pipe 300ZX is the epitome of that advice, but will its price and condition make it poetry in no-motion? Nature loves equilibrium, whether it be osmotic pressure or the perfect number of squirrels down your pants, it all eventually balances out. And that seems to have extended to the votes so far this week. Monday’s manic Corvette fell in one of the most egregiously lopsided votes ever, so much so that the Earth probably tipped on its axis a little, spilling some poor schmuck’s drink down in Louisiana. Bringing balance back to the universe once again, yesterday’s beater but much sweeter 1998 Volvo S90 earned a 97% Nice Price win. Now we can all breathe a little bit easier. You know, yesterday was kind of a gimme. After all, eight hundred bucks for a seemingly decent running Volvo that isn't covered in human feces or people wanting to talk to you about politics is pretty righteously easy like Sunday morning. Today however, you have a much more difficult task at hand. If someone told you that today’s 1995 Nissan 300ZX was only $2,000 your first question would be: wait a minute, what the hell’s wrong with it? Well, I’m glad you asked. This 300ZX - which is one of the good looking 300ZXs, and not that earlier I wanna’ look like an S30 but I’m just so fat ones - is in most ways pretty stock and of the non-T-roofied variety. It also sports a 5-speed stick between its multi-adjustable leather-wrapped thrones, and aside from missing its air-bagged steering wheel, glovebox door, and driver’s side door card, it looks to be in decent shape. Some of those kibbles and bits apparently come with the car, just hankering to be reinstalled. On the outside there’s a scratch in the paint behind the door, some light surface rust on the wheel arches, and the stock alloy wheels which for some reason I’m surprised to see on this particular car. Oh, and Lambo Diablo headlights! But I can’t be bothered with those aspects of the car because I’m like a dog watching the bacon wagon go by staring at the freak show that is the Infiniti VH45DE that has been wedged under this 300ZX’s hood. Well, under is a bit of a misnomer as the 4.5-litre V8 is actually too tall to clear the sloping hood which was originally intended to house a more compact V6. Now, most people would switch out the hood with one that has a riser, or some other form of clearance enhancement. But not this car’s builder. Oh semolina pilchard no! Instead, this car has had its stock hood contour cut for each and every engine part that would otherwise impair closing. That includes the VH45’s weird intake plenum that makes the engine look like it’s transverse when it’s really oriented the other way, and, mind your neckties, the fan. The nibbler-crazy engine install isn’t even the car's most important ad feature either. The seller also states that following all the work that went into the engine conversion, including a custom mating plate, pretty fly-wheel, and clutch, AND all the hoodwinking that went on to make the nose lid close, the Infiniti mill went south. He says that the car had run for over a year and 20K in its current hole-ier than thou condition until an aggressive freeway exit caused it to quit on him. The culprit is claimed to be coolant-loss induced seizure, which probably indicates that at the very least the water temp gauge had not been hooked up or converted or whatever. So now it needs a new engine. Try, Try, Again. And speaking of trying, I don’t know about the seller’s described eBay auction, as I can’t find the car there. I figure if the Craigslist ad is still up, he’s still got the car. And he’s still asking two grand for it You now need to figure out if that price makes this Nissan - now on its second engine - worthy of Palmers inspiring words: Tis a lesson you should heed, If at first you don't succeed, Try, try again, Mofo. I put that last bit in, I think it really punches it up, don’t you? 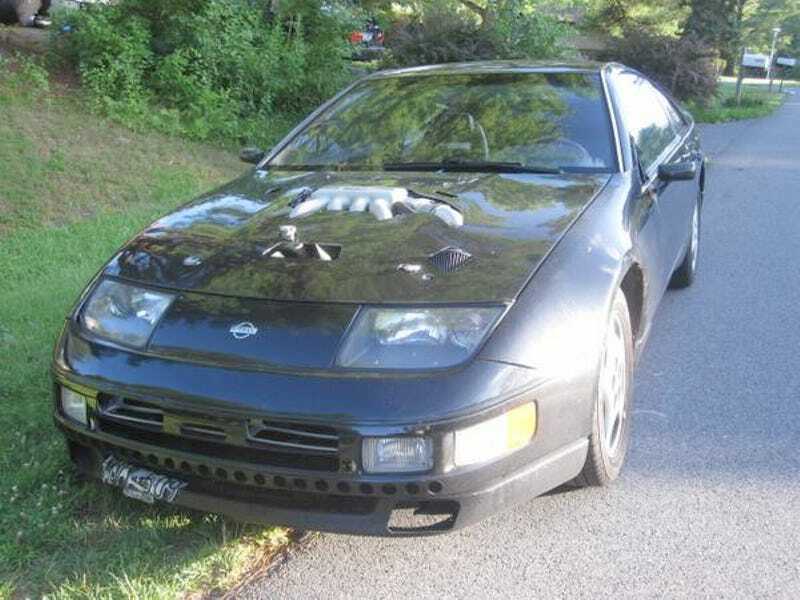 And, do you think this Infinissan 300ZX is worth $2,000 in its current condition? Or, does the cut up hood make you wonder what corners were cut, making that two grand just the start? H/T to charles5448 for the hookup!